There has been a rise in popularity over the last few years in facial contouring and rejuvenation procedures performed in this country. Everyone is looking for a solution to look younger. Both men and women are searching to find the right facial cream, a non-invasive temporary solution, such as BOTOX or fillers, and then there are those who seriously consider a more long-term alternative option like a facelift. A facelift is a plastic surgery procedure that can take years off your appearance by surgically removing sagging and wrinkled skin and creating a softer, younger complexion. Facelift surgery can be very rewarding for men and women. It can create a younger looking appearance with natural results that can last for years. Patients often ponder, when is the right time to have surgery? In addition, finding a seasoned and experienced facial plastic surgeon is critical. With over a decade of experience, Dr. Kevin Sadati of the Orange County area, is a highly regarded facial plastic surgeon. His goal is to work with patients and discuss all of the options available. Because facelift surgery changes the appearance of one’s face, it is important that patients feel ready, comfortable, and confident in their decision. 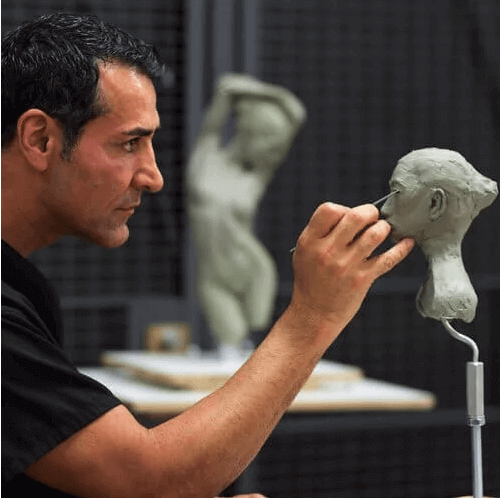 Board certified and renowned for his surgical skills, Dr. Sadati blends his fine arts background as a studied sculptor and painter with his surgical expertise to create amazing results for his patients continuing to set himself apart from other plastic surgeons. With today’s medical advancements in plastic surgery, there are many options available to customize your facial rejuvenation experience with a facelift either specific to one area or the entire face. So what exactly are you trying to address and which facelift is right for you? We break it out down for Orange County patients below. Are you noticing wrinkles that seem to be getting larger or deeper? Do you have static wrinkles present even when your face is at “rest”? Do you have loose skin that has lost elasticity? If you answered yes to any or all of these questions, then the time may be right to consider a facelift procedure. A facelift is considered a long-term solution to reduce visible signs of aging. Typically a procedure for older adults, who over time are dealing with the natural changes that happen as we age, a facelift can actually be catered to individuals of varying age depending on what type they are having. Tightening loose skin, removing wrinkles, and lifting certain parts of the face can all be beneficial in making you look and feel younger! The traditional (or full) facelift is a surgery that will enhance the entire face from the forehead down to the neck area. It involves a larger incision in the hairline and is the most in depth technique of all facelifts because it targets severals areas of the face and neck all at once, while also tightening the underlying muscular structure. Excess skin is removed and the remaining skin is pull taut and gently tightened behind the hairline for a natural, younger-looking result. Depending on the condition of your skin, age, and personal goals, this surgery can be combined with other cosmetic surgeries, as well as complimenting the end results with nonsurgical enhancements such as laser treatments, dermal fillers, or BOTOX. A brow lift, also known as a forehead lift, is a cosmetic procedure that dramatically reduces and eliminates creases or wrinkles along the brow or forehead area. When BOTOX alone no longer does the trick, patients can opt for this treatment to diminish and remove loose skin and wrinkles in the upper portion of the face. Incisions can be made along the forehead line, within the natural crease of the brow, or at the temporal areas of the face to tighten the skin outward toward the temples. Brow lift surgery can help patients look more awake and softer in appearance. An eyelid lift, also known as blepharoplasty, is a cosmetic procedure that removes excess skin on the upper eyelid area and can even reduce the appearance of “bags” under the eyes. As we age, our skin loses elasticity and eyelids are predisposed to “thin skin”. Due to this factor, eyelids are often the first areas affected by the natural aging process. Tightening skin or removing wrinkles around the eye area can take years off a patient’s appearance making women and men alike look more “awake” and younger! If a full facelift is not necessary, another alternative is a cosmetic lift targeting the middle area of the face. Loose skin and creases in the skin can be softened and tightened around the eyes and along the outer areas of the nose by utilizing small incisions made just behind the temples. The most prominent facial improvements with a mid-face lift are seen in the cheeks or jowl area as they are subtly lifted reducing the appearance of sagging skin. A mid-face lift is an option for middle-aged individuals who have sagging skin and wrinkles in the the mid-portion of their face but do not need a full facelift to look younger. A corner of the mouth lift is designed to help reduce facial sag near the mouth. Patients whose lower face droops or sags can give them a “frown” look to their appearance. When the corners of the mouth are lifted, this improves the overall mouth area, reduces the appearance of drooping jowls, and can rejuvenate the lower portion of the face for a dramatic result. Also known as a lower rhytidectomy, this procedure can help restore the neck and lower jowl area by removing excess, sagging skin on the neck. It can also remove excess fatty tissue under the chin in order to help contour the neck area, if a muscle band due to the natural aging process has occurred in the front or the back. A neck lift can help define your profile and create a more youthful look. A neck lift often weighs in as one of the biggest game changers for patients cosmetically when it comes to giving them the most dramatic results. So, which facelift do you think you need? Several factors contribute to the natural process of our skin changing with age. Sun exposure, genetics, weight gain or loss, and the fact that gravity is no longer our friend as we get older. In the Orange County area, women and men are taking back their youthful look so their outside matches how they feel on the inside. With so many facial “lift” options available, there is a solution to getting you feeling more confident and looking younger again. Board-certified plastic surgeon Dr. Kevin Sadati can help lead you through this process and find the right facelift solution for you. Call or schedule your facelift consultation with Dr. Sadati today.